I been stalking Loccitane websites around the globe for a couple of months now, enough to know that Loccitane Malaysia's GWP system and discount/sales is boring compare to neighboring Singapore or Canada (who had a mega online sales with latest products being slashed until you scream like a girl). 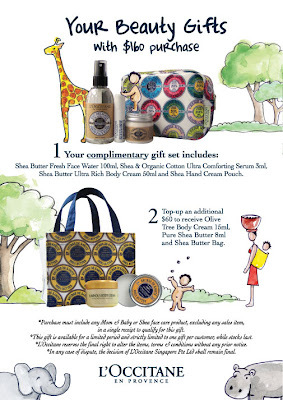 The latest promotion by Loccitane Singapore is another girl-screamer. Well at least for me... I still can't believe whether it's really that good or they have a typo error on their poster. I was thinking maybe they added extra 0 to the 10ml making it 100ml? and that 50ml body cream is probably 5ml? all typo? perhaps. NO ITS TRUE THERE IS NOT TYPO! my brother just called me from SINGAPORE confirming this is all real. I was like oooooommmmmggggg... why Malaysia's Loccitane GWP is so [fill in the blanks]. Business must be so good! Well I know Malaysia Loccitane member can get 5% discount but gwp really is sux man, they always give small items, even sachets consider as gift (Isetan member day Loccitane). Anyway this is the GWP poster from Loccitane Singapore. Tell me you can't believe it too. 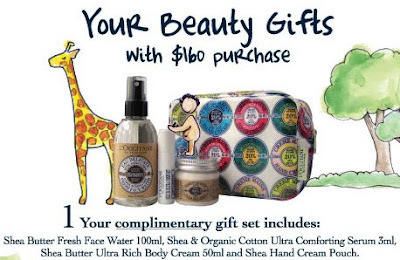 I hope Loccitane Malaysia improves their GWP system soon. My brother who was not a Loccitane member can even diffrentiate which promotion is better. He will be bringing back my Loccitane haul (which Loccitane Malaysia has been out of stock for 2 months! I am already feed up of waiting for it to be re-stock) & gifts tomorrow from Singapore. Can't wait to see to see my haul & the gifts. I am now a Loccitane Singapore VIP member too. Let me fill in the words for you. You mean why is it so LOUSY? 1) It could be tax system here. Although I doubt that is the case like south korea, since most imported skincare here seems to be fairly priced. 2) The company's police to squeeze as much from us- you know what i mean. 3) Singaporean's competition for skincare is really aggressive, and too many brands of the same nature. - That's another good reason, i guess. $160 = 160 x 3 = RM 480. With RM480, what can we get in loccitane for this amount- do they have any GWP for RM480 for the same value as what Singapore is offering? 4. a small round cylinder item (look like shea butter. and this is all small items compare to Singapore's gwp. I don't even wanna think about another subject matter. Sing $160 is AFFORDABLE FOR SINGAPOREANS! dollar for dollar! I WANNA CRY !!!!!!!!!!! rm so weak!!!! I heard from my frend who works in spore, but msian. She also found out that Msia's Loccitane always out of stock. And yes, Locci n spore when they're on sales, really worth better than Msia Locci outlet. sux la...Mayb miu u can write a complain letter to complain abt their gwp, if they continue like tis, we do a shopping spree on Loccitane S'pore. :) If everyone find out abt this, no one gona go Loccitane Msia outlet to buy, they can close dwn their outlets here. Loccitan Msia outlets have bad attitude and lousy promos. And their products are overpriced for below average performance. Hmm... let's see what Loccitane has to say when they read blogs like this, and realize we are buying from Singapore and bringing over here than buying from here.. They have to know that customers are getting smarter. Hi Miu... Hmmm I purchased fr Singapore before and asked abt their membership. 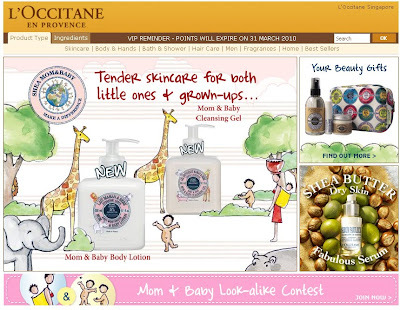 You can even view the benefits here [http://www.loccitane.com.sg/benefits-privileges,27,1,4755,55611.htm] online. They are not very attractive leh... Here in Malaysia RM1 you get 10 pts. Actually in Singapore, product wise they are kinda out dated. My bf's relatives who are Singaporeans don't buy brands like L'Occittane. To them it's expensive. They prefer brands like Etude House and Face Shop. No ones really buys Face Shop in Malaysia but they are hot in Singapore. I only buy the Honey & Lemon Range coz it's discontinued here in Malaysia and they aren't cheap. Exactly the same thing and the price is much higher. E.g. a bar of soap here is abt RM17 Singapore is abt RM19 after conversion.